Learn how to communicate "groove & feel" using the groove slang you learn from "Groove Descriptions". 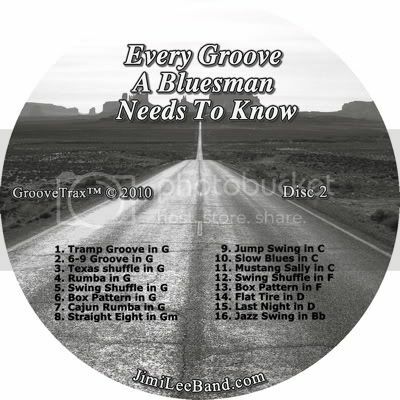 This is a Hard Copy 2 CD set entitled "Every Groove a Bluesman Needs To Know". 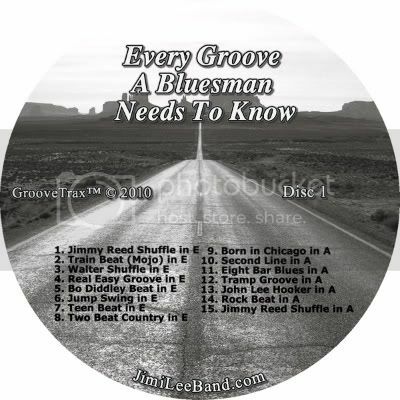 There are 31 "top shelf" Blues Grooves in all, with loads of different beats, tempos, keys and grooves. These backing tracks are designed to cover every blues groove a musician needs to know and how to communicate that groove using groove slang. It's a great learning tool for all members of the band. Drummers, guitar players and bass players all will benefit greatly by learning these particular grooves and the slang. All titles were carefully chosen and will help immensely to communicate with drummers, guitar players and bass players, to get the groove you want. The title of each groove is the slang musicians use to communicate that groove. Quite brilliant really! It helps a great deal to understand what the difference is between a Jazz Swing and a Texas Shuffle, or a Tramp Groove and a Second Line Beat? These are slang terms used by blues players. This is your chance to learn what slang terms like that, and lots of other lingo means, and best of all, what they sound like. Here lies a lifetime of information from working musicians and the slang and lingo used to communicate "feel", "groove", "beats", "bass lines" and more, without written music. Simply play any track and read the groove description provided several times while you listen. Identify each statement made in the description to the sound made in the music. Then memorize the slang used to communicate that musical idea, which is simply (the title of that groove). This is a product that comes from the desire to have jam tracks that really groove, with heavy hitting Blues-Cats playin’ them. GrooveTrax™ are like getting a PHD "from the boulevard of the blues". They will help make anyone "street smart" with the blues. They are perfect for playing lead blues licks and melodies on any instrument, whether it be harmonica, sax, piano, guitar or anything else playing blues music. “I love these tracks. Great stuff! The rhythms really percolate. Spiky and alive”. "Jimi Lee's Blues Grooves are the best in the business. It hurts me to say that, because I'm selling a couple of sets of jam tracks off my own website, but honesty forces me to admit: Jimi has me licked. I love 'em! He's got pretty much every rhythm that a blues harmonica player (or guitarist, pianist, or sax player) needs to know, and he has NAMED them all; some of the grooves here are things I've played dozens of times at gigs or jam sessions, but I never knew how to ask the rhythm section for what I wanted. Now I do. Jimi's tracks come in the major blues keys--E, A, and G--and he's got enough in each key, sequentially, to let you blow the hell out of one harp before moving on to the next. Best of all, he's come up with a stripped-down rhythm section that feels like the cream of the Austin crop. These guys hold down some awesome grooves: tight, alive, and right in the pocket. None of that soul-less computer generated crap. So if you're a developing player--or a pro like me--you're going to have your game lifted up a couple of notches, just by hanging on for the ride. This is a premium collection, worth every cent." “I'm a Believer! They sound great, natural and swinging :) These tracks make me want to pick up my harps and play :)”. ”This product will be a success I'm sure. It goes beyond any other harmonica backing tracks I've ever heard”.